Because skiing down the mountain apparently doesn't give you, like, enough of a rush, man, French professional skier/speed-rider Valentin Delluc has figured out a way to make it even more extreme/ dangerous/ ridiculous -- by grinding down the chairlift cables! Yes, on skis. And with a parachute. [Insert eye roll here]. One wobble away from being this dude, here's Delluc pioneering what's certain to be an X-Games event in the next five years. 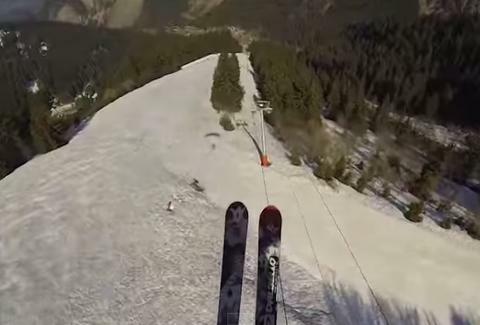 NOTE: Don't try this stunt on your backyard chairlift cable. Chloe Pantazi is an editorial assistant on Thrillist's travel team. She once went skiing in Italy and her instructor called her “disaster”. Follow her on Twitter at @ChloePantazi.